I just finished painting this dinghy earlier today! 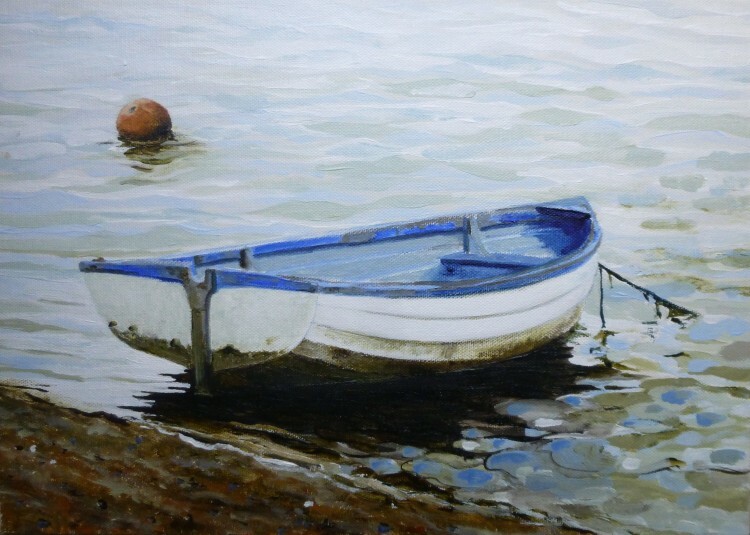 Dinghy on the Falling Tide is a little West Mersea dinghy that I’ve painted a couple of times before on different days and from different angles! It features in ‘Dinghy in the Shallows’, and ‘Dinghy on the Red Buoy’. I like the classic blue and white, the wide clinker build, and the way it is always so covered with mud! I think this will be one of the paintings that I enter for the Sentinel Select exhibition, which will take place in March. All the details, as usual, on the Gallery 2015 page. And I’ve just realised that in no time at all I shall have to ask my very clever webmaster, John Wheal, to make me a 2016 gallery page! It’s been a very dark and windy day here, with some rain in the wind – I was visiting an old friend this afternoon and the wind was roaring through the oak trees in her garden. BUT only nine more days till the winter solstice, when little by little, the days will start to get longer . . . . . .